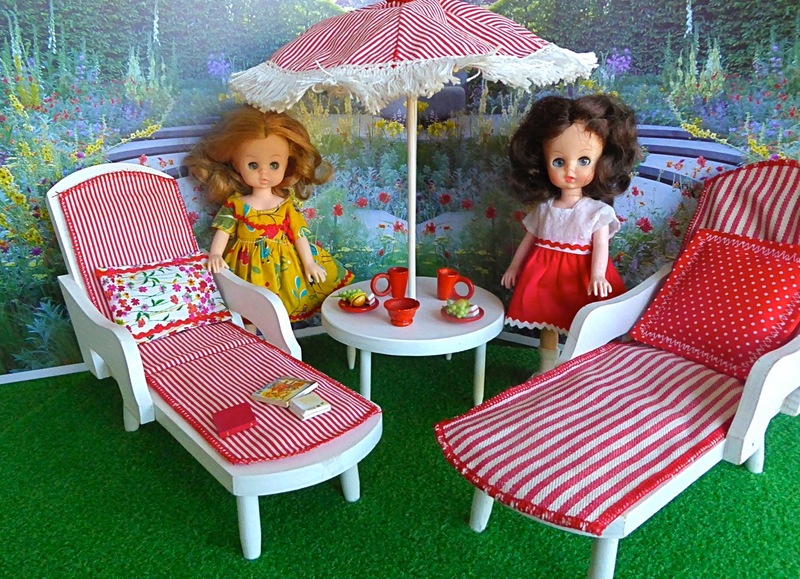 Chaises: Delightful duo made during the last mid century by the American firm, Halls Lifetime Toys, who were noted for their sturdy, high quality, wooden doll furniture. (One chair still has its original label). 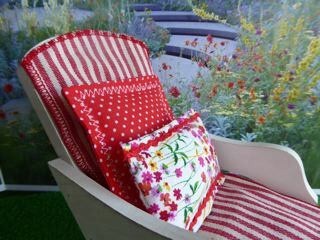 The set consists of two, matching reclining chairs with their original red-striped chair pads, plus two cushions we've made from vintage fabrics, to co-ordinate. On one chaise rest three little books. Umbrella and Table: This table and its removable umbrella were also made by Halls to match the two chaises above, but is a much rarer piece. 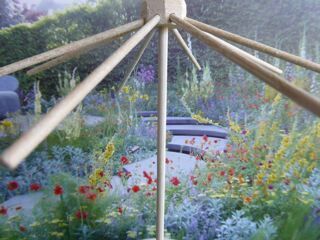 We were thrilled to find it in such good condition – the fringed fabric umbrella is in great condition and fits neatly over the eight umbrella spokes, which are detachable for storage. (please see close-up photo). 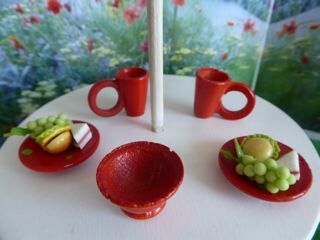 The little table is laid with a red, wooden picnic set – two plates, two mugs and a bowl, with the each plate holding dolly's sandwiches and a bunch of grapes. 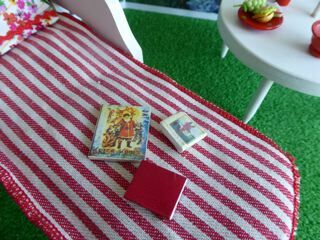 Background: A photograph (copyright of GOOD GOLLY MISS DOLLY) has been mounted on two pieces of A3 foam board. Each piece of foam board measures approximately 39 x 28.5cm or 11 x 15in. A piece of fake grass is also included in the price below. Dolls: Two, sweet-faced dolls, each 7.5in/19 cm tall, made in Hong Kong by New Bright Industries. They are charmingly outfitted in vintage doll dresses from our extensive selection. These dolls are available to order in the DOLLS section of this website.